Today's 31 Day Challenge prompt is "inspired by a flag," a prompt that no one seems to really care for. It's not my favorite either, but it does often get me thinking outside of the box! 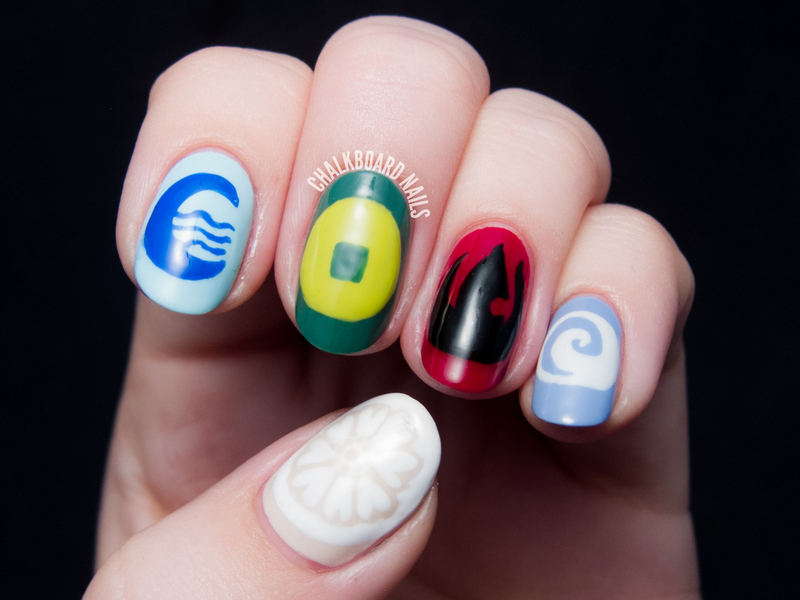 I chose to do nail art inspired by one of my favorite cartoons, Avatar: The Last Airbender. For those of you unfamiliar with the show, there are four nations in the Avatar world: the Water Tribes, the Earth Kingdom, the Fire Nation, and the Air Nomads. I represented each nation's flag on my nails, and put the flag of the Order of the White Lotus on my thumb. All elements of this manicure were painted freehand. I have the Water Tribes symbol on my pointer, the Earth Kingdom symbol on my middle finger, the Fire Nation flag on my ring, and the Air Nomad insignia on my pinky. I needed a fifth finger design, and the Order of the White Lotus seemed like a perfect choice! They transcend the four nations, and are good guys in the series. And um, hello, who doesn't love Iroh? If you are a fan of the Avatar universe, be sure to check back in tomorrow! 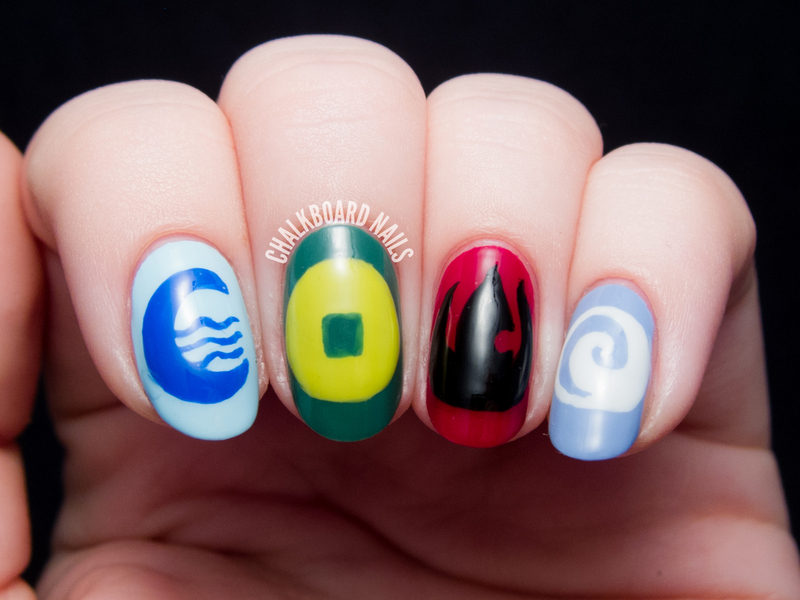 I've done some Legend of Korra nail art for "inspired by the supernatural." Consider it a double feature! YESSSS. This show is EVERYTHING. Love that you chose this. Came out awesome! Woohoo! 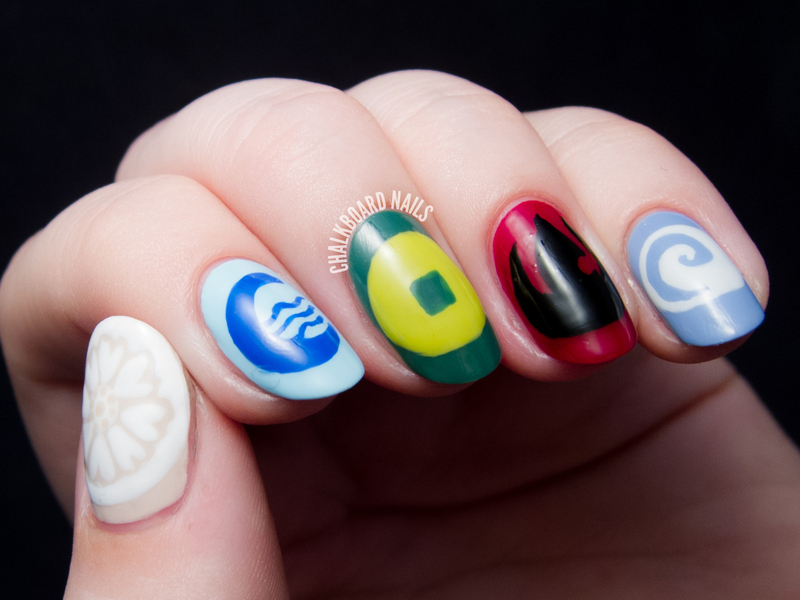 ATLA is fricken amazing and so is this nail art ;) Can't wait for tomorrows! The TLOK season finale was so EPIC. Iroh is probably one of my favorite fictional characters of all time! And Toph. Have you watched the trailer for the final season of Korra? I like tomorrow's more than todays, hopefully you like it as much as I do! Have you checked out the trailer for the final season of Korra yet? Yes OMG, it looks insane. Like aaaah omg, but I'll be so sad when it's all over! Sorry, don't know much about the show, but my husband is gushing over these nails. Never seen the show, but I really like the nailart! I'm in love with this series so it's so fun to see this! i love your interpretation of the flag theme, great idea! !